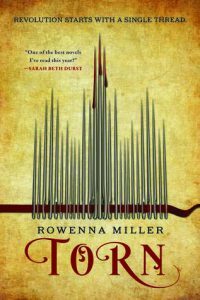 Torn by Rowena Miller is a fantasy novel that follows Sophie, a dressmaker who is known for sewing charms into garments. She supports herself and her brother Kristos with her business and by continuing to make dresses for the nobles of their kingdom. Her brother Kristos is a revolutionary and is strongly against the monarchy and the nobles that support it, which challenges Sophie.